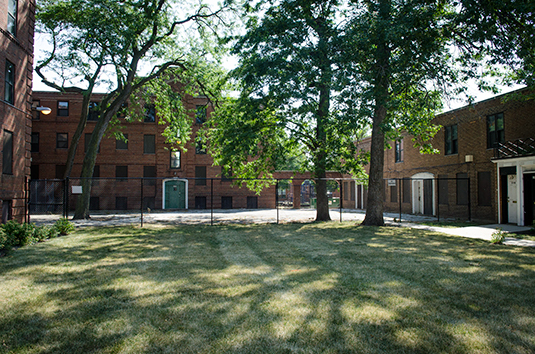 Open courtyards are one feature of Lathrop's unique 1930's architecture that distinguish it from high-rise public housing, which led to the complex being placed on the National Register of Historic Places. This section now sits entirely empty, with all the units boarded up. Lathrop Homes, a public housing complex along the Chicago River in the Lakeview neighborhood, has lost hundreds of residents over the 12 years that the city’s Plan for Transformation has been going on. Now, with only 170 families left, the section that sits along Clybourn Avenue has been closed entirely and residents have been relocated to the portion that lies along Diversey Avenue. These photos are of Lathrop’s survivors–a few of the families who remain living there, waiting for the transformation to come to their homes. Allan Charles, a current Lathrop resident, says he won't know what to do if he has to leave the development. After promising residents for many years that they could remain through Lathrop's revitalization, the Chicago Housing Authority has recently said residents may have to leave if safety issues arise. A current resident shows a family photo album with years worth of memories from living at Lathrop. A fence barricades the apartments along Clybourn Avenue. All of Lathrop's 170 families are now living in the apartments along Diversey. Georgia Coleman has lived beside vacant apartments for years. She says that even though she's been recently relocated to the section along Diversey Avenue along with all of Lathrop's other residents, she still has many empty units near her. Residents say this garden is now overgrown, but used to contain tomatoes and other vegetables. The family that tended the space has moved away. One-year-old Ariana Soto lives with her family at Lathrop Homes. Miller, a Marine veteran, used to live at Lathrop Homes, but he and his wife are currently homeless. They are hoping to return to the complex, but are currently on the housing authority's waiting list. Although all of Lathrop's families have been moved to the section of the complex that lies along Diversey Avenue, many units there still sit vacant. David Soto, 2, sits on the shoulders of his father, Juan Melendez, who's lived at Lathrop for 27 years. The two recently attended a rally calling for the Chicago Housing Authority to allow residents to stay through revitalization. Current resident Tony Sutton describes the complex as “close to his heart,” and says everyone who lives there is like family. Sutton says he doesn't want to leave his home. Jerry Galvan has resided at Lathrop homes for the past 17 years and says he has no plans to leave. Edna Hernandez no longer lives at Lathrop Homes, but she's still a part of the leadership team that's trying to guide Lathrop's revitalization. Her mother still lives at the complex. The Southwest Side neighborhood has seen an influx of newcomers from Latin American countries.